Edward Bullock Watts was born in Yeovil during 1785. He was the second son of Yeovil solicitor Samuel Watts the elder and Mary née Bullock. Nothing is known of his early life although he became an accomplished land surveyor, map maker and land valuer. He also became the official Town Surveyor of Yeovil. Edward was a member of the Yeovil Volunteers for many years and he was commissioned as its Quarter Master on 22 September 1804. He was also a partner in the wine and brandy merchants business of Cayme, Watts & Co. The other partners were were Edward's brother Thomas and Thomas' brother-in-law James Cayme the younger and his brother John Cayme. On Tuesday 14 July 1812 he married Sarah Garrett, eldest daughter of banker Christopher Garrett of West Lavington, Wiltshire. Edward and Sarah were to have five children: Hannah (b1818), Edward Bullock Jnr (b1820), Mary (bc 1821), William Augustus (bc 1828) and Fruzan Augusta (b1830). All the children were baptised at St John's church on 27 August 1830. Following his marriage left the Yeovil Volunteers and also, on 27 July 1813, he left the partnership of Cayme, Watts & Co.
Edward, Sarah and their family rented, for £20 a year, a property in Princes Street on the corner of Court Ash (see Gallery) - now the site of Batten's offices and formerly the Vincent's car showrooms of the 1930s. When Samuel Purchase, the owner of the property, was declared bankrupt in 1828 the property was sold off and it is assumed that Edward Watts purchased it at this time since he was recorded as the owner when he put it up for sale in 1835 - when it was described as "substantially erected within a few years". 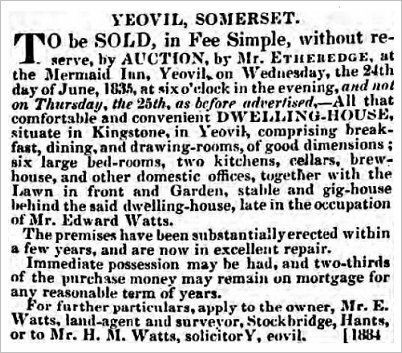 The description of the property from the notice of sale in 1835 notes that it was a "comfortable and convenient Dwelling-House situate in Kingstone, in Yeovil, comprising breakfast, dining and drawing-rooms of good dimensions; six large bed-rooms, two kitchens, cellars, brewhouse, and other domestic offices, together with the Lawn in front and garden, stable and gig-house behind the said dwelling-house, late in the occupation of Mr Edward Watts." It appears, however, that the property was not sold since Edward, Sarah, four of their children (Mary was missing from the census) and two servants were still there at the time of the 1841 census. Edward gave his occupation as a Land Agent and 21-year old Edward Jnr gave his as a Land Surveyor. In 1842 Edward Watts surveyed the whole of the parish of Yeovil, probably at least with the assistance of his son Edward Jnr, and produced the hand-coloured 1842 Tithe Map of Yeovil (see sample in Gallery). In their 1995 book "The Tithe Maps of England and Wales" Kain and Oliver noted that Edward Watts was the Tithe Map maker - having surveyed and plotted - of ten Somerset districts covering a total area of 14,375 acres. He was also listed as a Tithe Valuer of ten districts with a total area of 14,481 acres. On Saturday 20 January 1849 Edward Bullock Watts died at Bath. He was aged 64. Just five months later his land surveyor son, Edward Jnr, was made bankrupt. Edward Watts' signature from the 1846 Yeovil Tithe Apportionment. 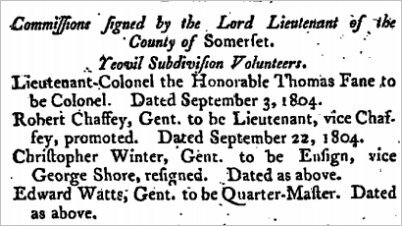 The notice of Edward Watts' commission of 22 September 1804 as Quarter Master in the Yeovil Volunteers from the London Gazette. The notice of Edward and Sarah's marriage from the 6 August 1812 edition of the Taunton Courier and Western Advertiser. The notice of Edward Watts leaving the partnership of Cayme, Watts & Co from the 31 January 1814 edition of the Salisbury & Winchester Journal. 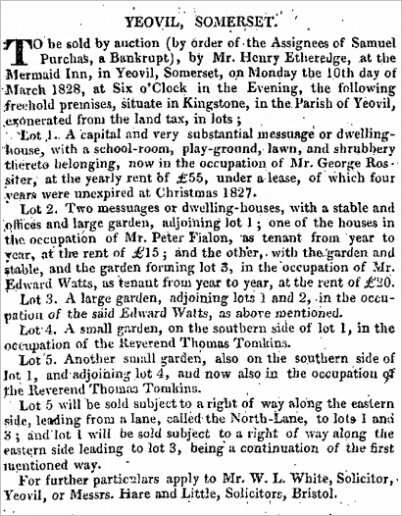 This notice of the 10 March 1828 sale of properties owned by bankrupt Samuel Purchase is from the 28 February 1828 edition of the Dorset Chronicle. 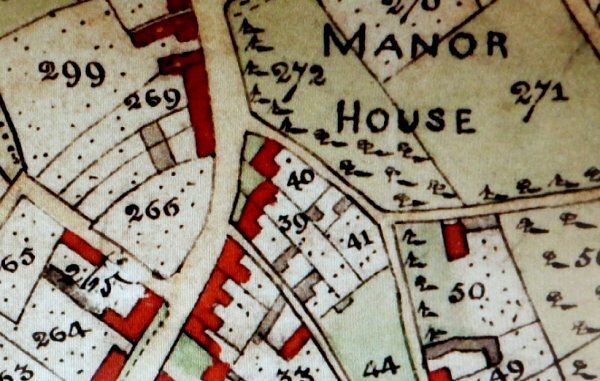 Lot 1, the school of John Rossiter, is today's Mansion House in Princes Street, the lesser of the two properties of Lot 2 is today's Magnolia House (or possibly its predecessor) while the larger of the two (see maps and photographs below) was Edward Watts' home - it is assumed he purchased it at this time since he was recorded as the owner when he sold it in 1835. An extract of Edward's own 1831 map of Yeovil with Kingston running off to top left, Princes Street running to centre bottom and Court Ash running off across to right centre. Edward's own property is at centre, marked '267', and is photographed below. 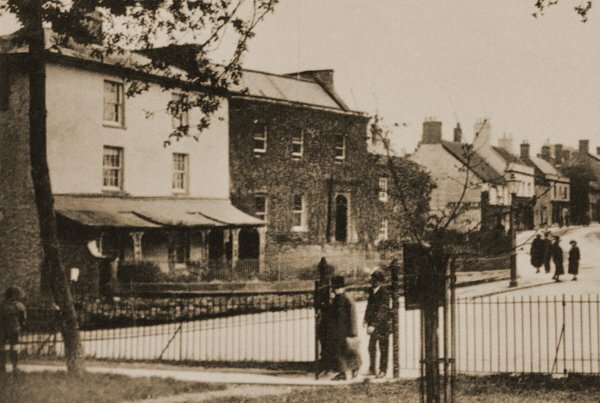 This photograph was taken from Bide's Gardens and shows the northern end of Princes Street / southern end of Kingston, with Court Ash running off to the left. most likely dates to the early 1920s, yet is probably one of the earliest of this location as witnessed by the building at far left, next to Mansion House (and enlarged below) on the corner of Court Ash. This was Edward Watts' home which he initially rented but later bought outright and is '267' on the map above. An enlargement of part of the above photograph showing Edward's home at left. 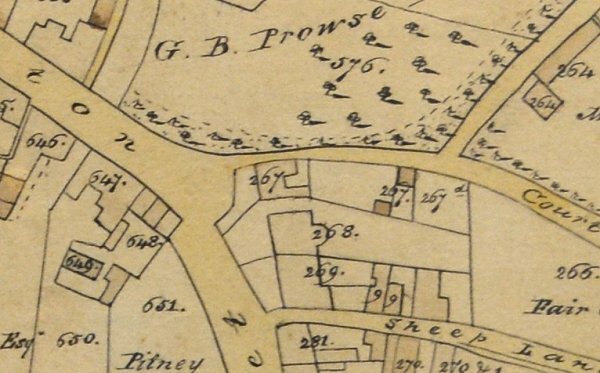 A portion of the 1842 Tithe Map, again drawn by Edward himself, but on a slightly different orientation - Kingston runs to top left of centre and Princes Street runs to lower left. On this map Edward's home is marked as parcel '40'. Although by this time Edward owned the property, sadly in this instance the 1846 Tithe Apportionment doesn't record the name of the owner. The notice of the sale of Edward Watts' home from the 22 June 1835 edition of the Salisbury and Winchester Journal. It appears that the property was not sold since Edward and his family were still there at the time of the 1841 census. 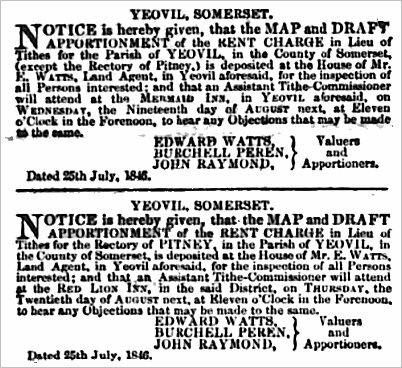 Notice of the deposition of the Tithe Map and Apportionment for Yeovil and Kingston Pitney from the 6 August 1846 edition of the Dorset County Chronicle.